Mat cutting tools took center stage in the mid 1980’s; After the Japanese revolutionized the quilting world! Read on to learn more! They introduced a tool that looked something like a pizza pie cutter with a razor sharp blade. Using this cutting tool, quilters quickly learned how to cut multiple layers of fabric with speed and accuracy and very few reported accidents. However, that is not to say that the tool can be very dangerous. This phenomenal impact radically changed the way quilts had been made for more than 150 years. To keep pace, the fabric manufacturers returned to making more cotton prints like they did in the 30’s and fabric stores began to be replaced with quilting stores. More and more quilting accessories were introduced and it was this explosion that brought back the art of quilting with a vengeance. The mat cutting tool or rotary cutter is the second most essential quilting tool…the self healing cutting mat was the first. The self healing cutting mat, the mat cutting tool and the quilting ruler, when used together, allows you to cut in many directions to include curves, swirls, straight lines and even some slight reverse movements. Apart, the three tools would be nothing more than three luxury items with little use. When used in conjunction with each other they make a dynamic trio! The protecting mat is put in place on top of your table and allows the razor sharp blade to be rolled along the edge of the ruler for a clean crisp cut. And to think that you are able to cut through multiple layers of fabric without damaging the table top. Real phenomenal, don't you think? There are a few Quilting Rules… when learning how to use mat cutting tools. In preparation for the first cut, fold the fabric by matching the selvage edges as best you can. Place the fabric on the mat with the fold closest to your body. Align a horizontal line on the ruler with the fold of the fabric and with the bulk of the fabric on your left. Using the mat cutting tool, make a straight cut through all layers of fabric. About a quarter inch or more of fabric will be removed to get a clean straight edge from which to begin. Move to the opposite side of the table, or rotate your cutting mat so that you can make the rest of your cuts with the fabric on your right. It is important that you don’t move the fabric and disrupt the squared edges. Sometimes the selvage edges may not line up, depending on the weave of the fabric. If this is the case, an alternative to squaring up your fabric is to clip the selvage and tear the fabric from selvage to selvage to find the true woven horizontal line. Then fold the fabric vertically, lining up the torn edges...not the selvage edges. It is important to check the accuracy of the cut edge after every few cuts. The best way to double check to make sure that your strips do not have a bend in the middle is to periodically open one of the fabric strips and check for a distorted angle that occurs right at the fold. Visit our Quilting Instructions page to learn what causes bends and how to fix the problem when it does happen. If you have a distortion, stop and even up the fabric with a straight cut through all layers as described above before continuing on. Using your dominant hand place the handle of the rotary cutter in your palm; place the other hand on the quilting ruler with the fingers spread and the smallest finger off the ruler to serve as an anchor and to prevent slipping. Push the mat cutting tool away from you. This enables you to apply more pressure on the rotary cutter, since a pushing motion is stronger than a pulling motion. Always cut away from your body with both feet flat on the floor and your head and body aligned on the cutting line. The mat cutting tool will follow along the right side of the ruler. Apply firm but even pressure and keep your fingers away from the blade of the rotary cutter as it rolls past your hand. Stop pushing on the rotary trimmer when you can no longer comfortably reach in front of your body. Walk your stabilizing hand up the ruler so that it is even with the cutter and continue to push the mat cutting tool. Cutting accurate strips takes practice. 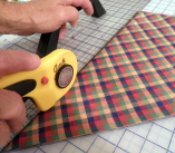 Practice on pieces of scrap fabric until you are comfortable operating a rotary cutter. It is very important to maintain the 90 degree angle of your edge. If the horizontal and vertical lines of your quilting ruler are both lined up with the edges of your fabric, the strips will likely be accurate. Since the beginning of the mat cutting tool the rotary cutter has gone through several upgrades. With the newer version it is easy to change a rotary blade so change it frequently. The 60-millimeter blade is comfortable for larger hands and makes multiple layer cutting easier. The 45-millimeter blade can cut up to eight layers. The 28-millimeter blades are favored for cutting curves and by people with small hands. A rotary cutter is only safe when the blade is sharp. A dull blade can require so much pressure that the cutter slips, causing damage to the fabric and maybe the hand. To prevent unwanted accidents always, always keep the blade closed when not in use. Keep all rotary cutters or any other tool that could hurt, out of the reach of small children. This is another view for changing the blade on an older rotary cutter. For this type blade when cleaning and changing blades place the parts down in the order in which you removed them to make changing the sharp blade reassembly easy. There is a right way and a wrong way, so pay heed! 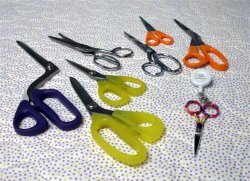 Scissors have an intended purpose and it is important to match the jobs with the quilting tools. As length increases, so does handle size so match the scissors with the size of your hand. In your arsenal of cutting tools be sure and include a pair of high-quality scissors as you will find yourself doing a good deal of cutting. Scissors come in all shapes and sizes and for many unique jobs such as trimming mustaches, for cutting carpet, for cutting nails, for cutting hair and on and on. They even make leftie scissors for lefties; everything else is for right handed people. To cut, hold the scissors upright; open the blades as wide as possible and cut from the pivot point to the tip. When making angular cuts, cut counter clockwise if you are right handed and clockwise if you are left handed. Paper cutting skills are just as important as fabric cutting skills. For both kinds of cutting you need high-quality scissors. Use small thread clippers to cut threads while at the sewing machine or while doing hand sewing. Having to hunt down your scissors is the single most annoying chore you will do while quilting. I minimize hunting my scissors by using a retractable scissor holder that I clip on my shirt so I never have to break my concentration. Try it; you might like it!